Our global CDN service is the only one on the market that improves user engagement through faster page loading and reduced image payload. This translates into lower bounce rates and reduced CDN costs. Because we approach the challenge of content optimization differently, we are able to improve search engine optimization for many eCommerce companies. ImageEngine improves web users engagement through its effective and image-optimizing CDN. On average, websites using ImageEngine load 28% faster than most CDNs, and 35% faster than image management solutions. 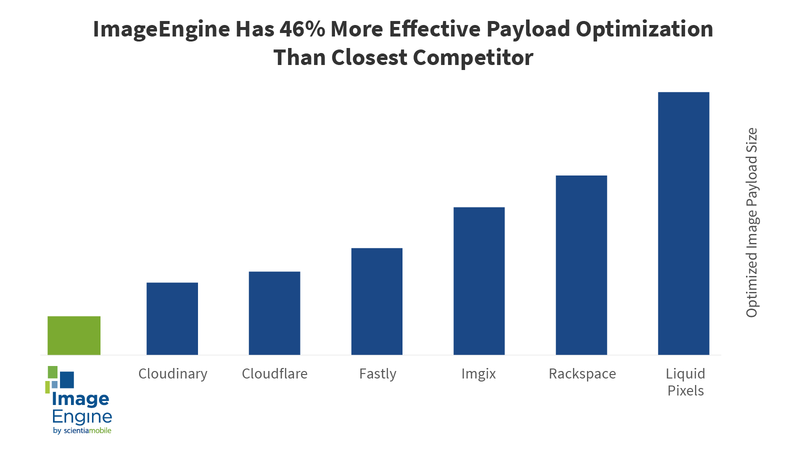 And when it comes to image payload optimization, ImageEngine is 46% more efficient than the closest competitor. Device-aware edge servers instantly identify the smartphone, tablet, or desktop requesting the image. 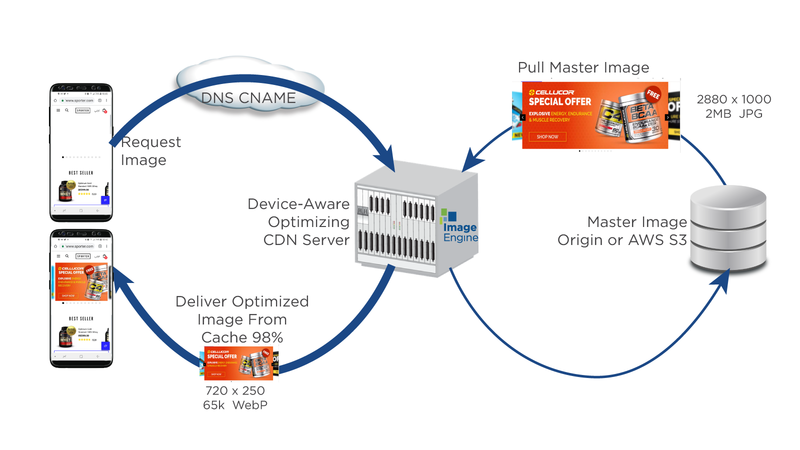 With an accurate assessment of each device’s capabilities (device model, OS version, resolution, pixels per inch, maximum viewport, support for image and video formats), ImageEngine’s CDN service automatically tailors a master image exactly to the device without any cropping or resizing by the customer. And it can immediately deliver the image from its cache 98% of the time. ImageEngine has device-aware edge servers capable of delivering billions of images at POPs around the globe. Its scalable CDN service architecture pushes device aware detection and image resizing logic to the network’s edge. The result is device-specific images delivered from the cache 98% of the time for blazingly-fast load times (Don’t believe us? Request a trial). ImageEngine ensures that image quality surpasses what is perceptible on each requesting device. Its optimization algorithm takes into account device size, resolution, and image format. It also monitors structural similarity index and the thresholds for perceptible image quality changes. ImageEngine goes out of its way to automatically produce an image that delivers high visual quality with the lowest possible byte size. Simplified Integration Integrates easily with any eCommerce or publishing platform or development library. Includes Magento/Magento2, Shopify, Wordpress, Drupal, Sitefinity, SiteCore, Kentico, React, WooCommerce and many others. Customers can integrate and have ImageEngine optimizing their entire website within minutes. Customers can deploy using CNAME DNS records, plug-ins, or URL prefixing. ImageEngine can pull content stored from their current location, with no additional uploading required. 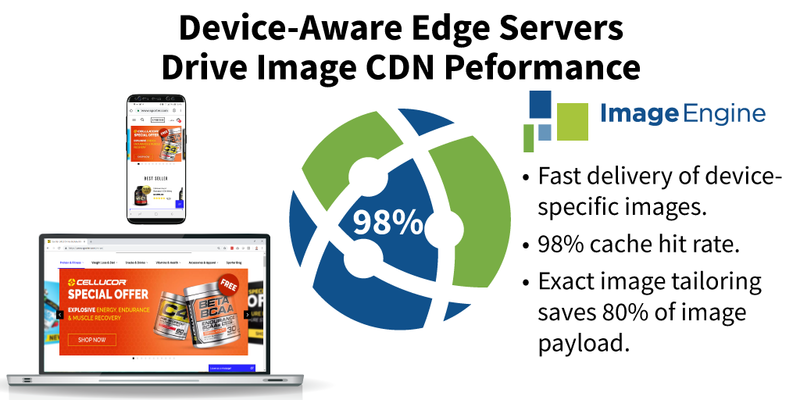 As an image CDN, customers can continue to use their existing CDN for non-image traffic, and route only images to ImageEngine for superior performance. The key to delivering an optimized image payload is quick and accurate mobile device detection. ImageEngine is the only mobile optimizer solution on the market that uses proactive mobile device detection from WURFL® by ScientiaMobile. ImageEngine automatically adapts and delivers an image that is the optimal size, compression, and format for the device. Because of device detection, ImageEngine is 46% more effective than its closest image device optimizer management competitor. ImageEngine adapts the original image based on the specific requesting device. It automatically compresses, resizes, and changes format to generate an optimized image. JPG, JPEG 2000, JPEG XR, BMP, GIF, PNG, and WEBP formats are supported. Typically, images are reduced by more than 60% for both desktop and mobile devices, with no discernible degradation in visual quality. Since ImageEngine automatically adapts images, enterprises can eliminate unnecessary resizing processes and additional programming labor. In most cases, enterprises save 90% of the time and labor, freeing up employees to work on more strategic projects. Client Hints is an emerging standard, spearheaded by Google, which enables the browser to append information about how an image should be displayed, such as size and device pixel ratio. ImageEngine does not rely on Client Hints, but can use this information if it is available. With the addition of WURFL data, ImageEngine has all information needed to produce an optimal result based on how and where a specific image is displayed. ImageEngine has powerful POPs strategically positioned around the globe to serve viewers – especially mobile ones. This advanced image CDN architecture has device-aware edge servers. With this device intelligence, ImageEngine delivers optimized images from the network’s edge cache 98% of the time. This quick CDN response means blazingly fast load times for viewers. And the architecture is robust enough to deliver billions of images to viewers around the world. Even if you have an existing CDN relationship, ImageEngine can still optimize your images. You can easily combine ImageEngine and any CDN either by putting ImageEngine in front of, or behind, your CDN. ImageEngine measures an enterprise’s image payload after dramatically reducing it. This optimized payload is called “Smart Bytes.” Unlike other CDNs and image platforms, ImageEngine customers pay for only this reduced Smart Bytes payload. Combining Smart Bytes pricing with ImageEngine’s superior performance generates significant savings for customers. Learn more about the ROI for ImageEngine. And see why ImageEngine is a great alternative to Cloudinary, Akamai, and Fastly. ScientiaMobile backs up ImageEngine with a performance guarantee. If ImageEngine does not generate more than a 40% reduction in total image payload, then ScientiaMobile will provide one free month of ImageEngine service. eCommerce websites need image acceleration and an image optimizer to improve the mobile experience, increase engagement, and execute an omni-channel strategy. Now, Magento and Shopify users can easily integrate ImageEngine to reduce image payload and improve their site’s speed by almost 60%. Simple instructions for Magento are here, and Shopify integration directions are here. For WordPress site administrators, deploying ImageEngine is easy. By using the W3 Total Cache plugin and a CNAME to direct traffic, ImageEngine image optimizer will automatically resize all images on the customer’s WordPress site and deliver performance improvement. For developers who want to directly integrate, they can follow our simple integration guides for WordPress, Drupal, SiteCore, Sitefinity, and Kentico. With Responsive Images, developers still need different versions (sizes, formats, crops) of the image to exist. For this, you can use ImageEngine. This way, you don’t have to create 5-10 versions of an image. Actually, when in Responsive Images syntax you’ll have to write 10-12 lines with reference to images, you only need one references with ImageEngine because the built in device detection. Learn more about how ImageEngine is a more elegant, streamlined, and faster alternative to Responsive Images. Or watch our COO Steve Kamerman explain why your images are loading slowly and how to fix it. ImageEngine users receive the same high level of support as other ScientiaMobile commercial products. Basic and standard level customers can contact support for onboarding issues, and all other customers can submit priority tickets through our Enterprise Support portal. The ImageEngine license supports different commercial use scenarios (single and multiple domains, enterprise-wide use, intranets, and OEM arrangements). ScientiaMobile can extend pricing to support non-standard commercial agreements that require additional domains (e.g. OEM). Support of CNAME and SSL certificates requires a non-standard agreement. Please contact our sales for these arrangements. Learn more about over 500 device capabilities that you can use to optimize your website logic. Each product has documentation to help with the installation and implementation process. Check out our FAQs page to find answers to all the most frequently asked questions. Receive onboarding or enterprise-level ticketed support. ScientiaMobile actively monitors support tickets. 3 Reasons Your Responsive Web Images Load Slowly. And How To Fix It. Most of our customers are using mobile in a region with few POPs, so reducing image size without reducing quality is critical. ImageEngine helped us with that.